Among Redrock’s newer line of weld automation equipment is our Clad Cell Automation Station. An engineering breakthrough bringing a combination of TIG welding quality with the speed of MIG. Our Clad Cell Automation Station offers an easy to use interface for computerised pre-programmable weld operations and is suitable for Hot/Cold Wire Pulsed TIG. All weld parameters including positional information can be stored for reproducibility allowing the automatic welding of complete components. Programming can be configured by client preferences. Operators may be approved to make minor changes decided by engineers or senior operators, or more enhanced and complex changes may be uploaded to the PLC by approved engineers. This can include altering the stored data from earlier operations so only senior weld operators, or technicians can make configuration changes to existing stored processes. The PLC provides easy programming, reliable control and fast fault diagnosis, which is fully configurable to individual requirements. Set your processes, monitor the progress, change as necessary, watch your quality and speed soar. Set minimum and maximum parameters on the PLC to give alarm messages to operators when the values are out of range. Data logger module can store the data of weld conditions and store operator input records. Arc Voltage Controls provide automatic height control of the welding torch above the workpiece. Our pipe stands are available for sale or to rent on a short or long-term basis. Whichever option you choose, our after sales support is second-to-none. On a rental basis, our engineers maintain the equipment. When buying from Redrock, clients have the solid backing of our comprehensive three-year warranty, providing three-years to see a return on the investment without incurring repair costs along the way. 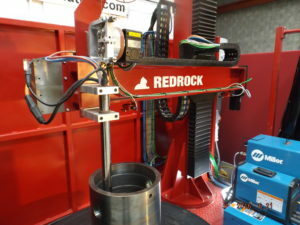 Redrock Automation specialises in design and manufacturing of weld automation equipment. We have facilities and distribution depots located in the Netherlands, France, Germany, Spain, UAE and Saudi Arabia. With a total of 100,000 square feet of factory space and an in-house team of talented, experienced designers and engineers, we can design and manufacture truly turnkey weld automation systems and deliver and install anywhere in the world. Our objective is to become the ONE STOP SHOP where our clients have us top of mind to deliver innovative weld automation solutions to deliver on client objectives. All equipment fully-serviced and warranted for three years. Custom solutions available with pricing to suit any budget. SHORT TERM PROJECT? CONSIDER HIRING.